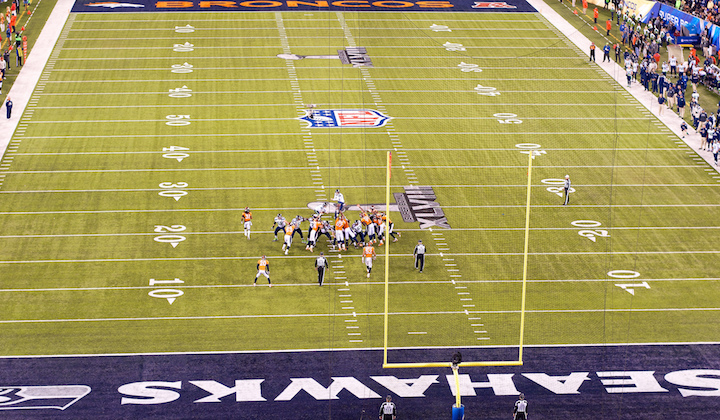 This Sunday brings the holding of the annual Super Bowl, American professional football’s championship game. I thought I’d write about some noteworthy appearances or mentions of the Super Bowl in cartoons. The most memorable episode, the third season’s “Lisa the Greek,” features Homer using Lisa’s football-winner-predicting talents to place bets. The episode’s seen some amount of dubbing in reruns over the years (of the team names). Said dubbing was parodied in a follow-up episode. “Sunday, Cruddy Sunday” was a tenth season episode centering around Homer and Bart going to a Super Bowl game. The episode in one scene made fun of “Lisa the Greek”‘s dubbing over the years. “You’re in the Super Bowl, Charlie Brown” doesn’t feature the actual Big Game itself, but ties into football heavily. The 1994 special sees Charlie Brown and his pals take part in a football punting contest (for a new bicycle and a trip to the Super Bowl). Meanwhile, Snoopy coaches a team of Woodstock and his bird pals to the animal version of the Super Bowl. The episode’s yet to appear on DVD (the Wikipedia article suggests issues with the NFL imagery used in the special). However, it was released to VHS in the 90s. The Bill Amend comic strip “FoxTrot” often mentioned the Super Bowl during the week before the game, back when it was a daily strip. My favorite such storyline features Roger and Peter anticipating the Big Game with awe, annoying Andy with their countdown to Super Bowl Sunday. Later that week, we see Jason and Paige’s plans to avoid the game: Jason plans to go to Marcus‘ house, since Marcus has a new big-screen TV—which doesn’t work. Paige, seeing Roger dressed up for the game in Dallas Cowboys paraphernalia, asks Jason if she can tag along. Years later, a Sunday strip shows Jason, Paige, and Andy now interested in the game, but only for the commercials. As an example of cartoons being mentioned during the actual Super Bowl, MetLife insurance ran an ad during 2012’s game featuring a wide range of classic cartoon characters; said characters ranged from Mr. Peabody and He-Man to Atom Ant and Richie Rich. For those who aren’t fans, but are interested in watching the game anyway, there’s this animated YouTube cartoon (by Fraser Davidson and others) explaining the basic rules of the Super Bowl and football in general.